Selected papers: Finitely additive measures and problems of asymptotic analysis (A.G. Chentsov). Time-optimal control in a third-order system (F.L. Chernousko, A.M. Shmatkov). Stabilization of dynamical systems with the help of optimization methods (R. Gabasov et al.). Optimal control of a system under disturbance (V.M. Alexandrov). On problems of guaranteed filtering for linear functional-differential systems (B.I. Anan'ev). Positional optimization of hierarchical control system (N.V. Balashevich). On existence of periodic solutions for linear difference system with continuous argument under periodic control (M. Blizorukov, G.-S. Yoo). A scalar conflict control problem with nonlinear functional condition (S.A. Brykalov). Degree of convergence of finite-difference operator while solving cauchy problem for Hamilton-Jacobi equations (S.V. Grigor'eva, A.A. Uspenskii). The problem of optimal control of almost periodic motions of a linear system with quadratic quality functional (A.G. Ivanov). On the estimation problem for one class of nonlinear systems (R.I. Kayumov). Dynamical restoration of controls for distributed parameter systems under uncertainties of system states (A. Korotkii). Level sets of value function and singular surfaces in linear differential games (S.S. Kumkov, V.S. Patsko). Numerical modelling of control time-delay system (O.B. Kwon et al.). On approximation of asymptotic attainability domains (S.I. Morina). Differentiability of speed function and feedback control of linear nonstationary system (S.F. Nickolayev, E.L. Tonkov). Relaxational polyhedron of veber problem (A.V. Panyukov). Algorithm of optimal time moving of a linear system to the convex compact (G.V. Shevchenko). Projection method of approximation gradient for convex programming problems (V.A. Tyulyukin). Evolutionary algorithms for multiple criteria decision making in control (P.J. Fleming, A.J. Chipperfield). Author index. This workshop was divided into three sections: optimal control problems; extremal problems of finite measures; and applications. 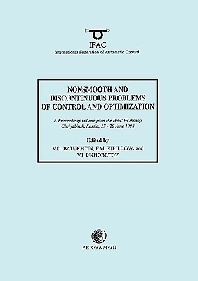 The section on optimal control contains papers on differential gains; synthesis evaluation and system control under conditions of uncertain information; stability; and qualitative optimal control problems. The second section describes problems of finite measures under extreme conditions and numerical methods for solving such problems for non-smooth and discontinous functions. The third section contains applications. Research workers in academia and industry with an interest in non-smooth and discontinuous aspects of control.